“There it is!” I shouted, as I hooked my first steelhead ever, after four days of fishing without luck. The fish had taken my Intruder at the end of the swing, and was giving a brave fight downstream from where I was wading. It was a very strong fish, considered the cold water (3-4 degrees Celsius); it fought for about ten minutes before my guide Ed Ward could land it safely. “Let’s do the science!” he said, apparently happy and relieved that he finally had been able to conduct me to my first steelie, for which I had been travelling so far. The fish’s length was measured to 34 inches, and its waist to 20.5 inches. Its weight was estimated at 21 lbs. After having taken scale and fin samples, having tagged the fish in the back, and having shot a couple of pictures, Ed released the beautiful creature. Why doing all this mess with the fish, instead of releasing it as quick as possible? Because I was participating in my first scientific fishing expedition, which was organised by the American based organisation called the Wild Salmon Center (WSC). Theoretically, it is forbidden to fish for steelhead in Kamchatka, unless there are scientific purposes related to it. Steelhead is in fact listed in Russia’s “Red Book of Endangered Species”. For a fisherman, the only “legal” solution for getting in touch with Kamchatka’s steelhead is to book a trip through the WSC, since the WSC is the only organisation that is licensed to do that type of research in Kamchatka. The expedition goes under the project “Kamchatka Steelhead Project”, which is the result of successful collaboration between Moscow State University and the WSC. The idea with the fishing trips is that fishermen shall bring data from steelhead to the Russian and American biologists, by practicing catch-and-release flyfishing. I had chosen to buy a two-week long trip, which brought me to northwest Kamchatka , on three different rivers: the Utkholok, the Kvachina, and the Snatolvayam. The plan was that we should stay one week at the Utkholok Camp first, and then one week at the Kvachina Camp. The Snatolvayam river was flowing a few miles from the Kvachina, and it was easily reached by horse. On the first day, I met the WSC staff and the other anglers with whom I would bring the next couple of weeks, at Petropavlovsk airport. Petropavlovsk is Kamchatka’s biggest city with its 250.000 inhabitants. All in all, 350.000 people live in Kamchatka, which stretches over 750 miles from north to south and 250-300 miles from east to west. I was surprised that we weren’t more, as I had read that the trip could take up to six fishermen. But we would only be three: Jim, Ken and myself. This sounded like pure luxury: three anglers to share three world-class steelhead rivers! From Petropavlovsk, we would have to travel 300 miles in the northwest direction, in a Russian MI-8 helicopter (same type of helicopter as used on the Kola Peninsula). The flight was incredible, it had been snowing the night before, and the landscape, which was a mix of mountains and volcanoes, was awesome. Unfortunately we weren’t able to spot any of the many bears that populate the area. We flew during two hours and landed in Esso, a little town where the helicopter needed refuelling (I didn’t invent the name of the town!). One more hour of flight and we landed at the Utkholok Camp late in the afternoon. At last I was standing here, near one of the best steelhead rivers in the world, that place I had seen pictures of and had read articles about. I recognized at once the typical Russian red tents that composed the camp. I was shivering! We met Ed Ward, a very well known steelhead angler and guide from Washington State. Ed would be our guide for the week to come. We also greeted the Russian staff: a cook, a biologist (Oleg), and three other helpers. Under the whole stay, these people were very nice to live with, always smiling and supporting us. Of course it was quite difficult to communicate properly with the Russians who couldn’t speak English. But in that way we learned a few Russian words, and the vodka also contributed to the good atmosphere during the evenings! Ed told us that the river was unfortunately off-colour and running very high, and that we shouldn’t expect too much for the coming couple of days. Everybody accepted this; the Spey casting technique could be practiced and fine-tuned then! Most anglers fish indeed with Spey rods here, 13-14 foot and class 7-9 rods are well suited for the conditions. During the first evening, we tied leaders, tipped, and looked in each other’s fly boxes: lots of marabou and orange/red/pink colours dominated. The next morning, we woke up and were quite excited, as we could spot fish movement in the surface of the river. And we are not talking about small fish here! After the breakfast, we (us threes anglers, plus Ed and the biologist Oleg) jumped in two Zodiac boats, equipped with jet engines. It was easy with those machines to zoom up and down the river, even at low water conditions. We sailed to the first pool downstream from the camp and fished it through. We could see that the water was still very high and muddy. The current was fast and we had difficulties in getting our flies to the bottom. Heady sink tips were necessary. I was myself concentrating more on my Spey cast than on the fishery itself, as I had only been fishing with Spey rods for about two months. Ed turned out to be a great casting instructor. I rapidly observed that he had developed his own little technique (of course based on the classical Spey cast) so he was able to toss his heavily weighted flies out there. I tried to apply this technique, and after a little while I was able to cast at a reasonable distance. When fishing for steelhead, it is important to let the fly swing in a very uniform manner, without giving life to the fly, as it is commonly done under Atlantic salmon fishing. Our big marabou flies had already enough life in themselves with the help of the current, without it being necessary to give them more movement. With the fast current, it was also necessary to mend heavily upstream a few times during the swing, so that the fly didn’t pass the fish at high speed. After a while, we drifted down to the next pool, which was also big enough to carry three anglers. But this one didn’t throw any fish either. Ed told us that with this high water level, these two pools were actually our only options for the few days to come, as the other pools would not allow for a convenient swing of the fly. We returned to camp for eating lunch, and thereafter took a well-deserved nap! In the afternoon we fished the two pools again. We saw fish coming to the surface, and this was very motivating. But none of them dared to take our flies. Quite tired and sore in the shoulders after our first day of steelheading in Kamchatka, we left the river at around seven o’clock. There was a very special atmosphere in such a scientific camp; it was not a usual fishing camp as I knew them. In the evening we got the opportunity to talk to the Russian biologist Oleg, who spoke fluent English. It was very interesting to learn more about the steelhead’s life cycle. For instance, Oleg told us that rainbow trout and steelhead is in fact one and same species when they are born. Then, if a juvenile rainbow/steelhead considers that there is too little food in the river, it will escape and head for the nutrient-rich sea, and become a steelhead! If instead the fish believes that there is enough food in the river, it will stay and become a resident rainbow trout. A resident rainbow trout can actually spawn with a steelhead. Two rainbow trout spawning together can also produce small steelhead! It was very surprising for me to hear that, I had always believed that rainbow trout and steelhead had something different biologically. That means that food-poor rivers have a tendency to carry more steelheads, while a nutrient-rich river will contain more rainbow trout. This theory also explained why the steelhead rivers in Kamchatka are all situated on the west coast: there are no volcanoes there, and the landscape is tundra, as in northern Sweden. All volcanoes in Kamchatka are situated on the east coast. Their ashes produce very fertile soil, which implies that plants and insects can develop quickly, also in and around the water systems. Therefore, rivers on the east coast contain many fat rainbow trout, and no steelhead! The next day, we could observe that the water level was going down; over the night it had dropped about four inches. That was promising said Ed: when the water level is dropping, the steelhead has a tendency to find a quiet standing place in the river, and then becomes easier to catch than when it is swimming upstream. The morning fishery did not produce any strikes unfortunately, but with the sun the water would be warmer for the afternoon fishing and that would maybe result in more aggressive fish. After lunch we mover down to our usual pool, and started to fish it through. I was casting and casting, observing the beautiful nature and dreaming a little, when the strike came very hard and unexpected! I got awakened quickly, the fish took a first rush, and I understood that my reel brake was set too loose. I tried to stop the fish by palming the spool (and got some serious hits on the fingers by the handle!). Suddenly, the fish chose a new tactic: it swam directly towards me! I was spooling in like crazy to keep contact with the fish. Then the fish took off again and the hook pulled out! Everything had happened so quickly, it had been very intense; I had been fighting the fish with my whole body, not only my arms, but also back and legs. What an anticlimax: first dreaming, then a wild and crazy steelhead at the end of the rod, and finally lost fish! Incredibly intense feelings! That had been our first contact with steelhead, at last! In the late afternoon, Ken managed to land the trip’s first steelhead, a beautiful female of 32 inches and about 18 lbs. Then we got the opportunity to see how Ed and Oleg took scale and fin samples, measured and tagged the fish. Oleg told us later that the scales can be read like a tree log where one can calculate the tree’s age: with the scale samples one can tell how old the fish is, how long it has been staying in the sea, and how many times it has been up in the river to spawn. With the fin sample, DNA analyses can be made later on in a laboratory. And the fish are tagged, in case it should be caught again later on. All in all, about 150 fish are tagged every season by the WSC. And very few tagged fish are being caught each season, which indicates a very healthy population, since the amount of tagged fish apparently only represents a little part of the total population. The next two days went like the first one for me; I didn’t get in touch with any fish. I was starting thinking about the impossible: to go back home without having caught a single steelhead… For Ken everything was going fine: he was catching a fish daily. He turned out to be a very habile angler, who has lots of experience from his home waters in Oregon. Unfortunately, it didn’t go better for Jim than for me; he had hooked two fish without landing a single one. On the last day on the Utkholok, both Jim and myself were depressed over not having landed steelhead yet, and Ed was feeling bad about it. In the morning, Ed and myself sailed upstream in order to fish a new pool through. For once, Ed was fishing as well (he was fishing behind me of course), he could not understand that the fishing was so slow, and wanted to check it out. After one hour of fishing, Ed managed to land a steelhead that gave him a very good fight far downstream. That fish had been in the river for a while, that was visible on the fish’s colour, but it was confirmed when we took the scale samples: they were hard to peel off the fish’s body. I was happy for Ed, but felt a little stupid that I didn’t get this fish. I had just fished this area through before him. In the afternoon, we went back to the same pool, hoping for more fish. This time, Jim came along with us, and Ed was not fishing anymore. After half an hour, I was able to hook a fish, which I landed as described in the introduction. It took the fly (an orange/pink marabou Popsicle) very hard, but I set the hook quite late, as I was dreaming again (after three days without contact one looses hope…). This was in fact fine, Ed told me that many beginners have a tendency to set the hook way too early, before the fish has had time to turn. What a great feeling it was to land one’s first steelhead, my whole body was feeling strange! But I could not exult too much, since Jim still hadn’t landed his first fish yet. I wrote my fish’s number (the number on the tag set in the fish’s back) down. When Oleg has read its scales and DNA, he will be able to tell me everything about his life. I am looking forward to hearing more about that, one gets a more personal contact with the caught fish, especially when thinking that it is now swimming in the Orkhotsk sea and hopefully has spawned successfully to produce many small steelhead for the next seasons! Next day, it was time to move on to the Kvachina Camp. It was sad to leave our Russian friends and Ed here in Utkholok. I felt that I had learned an awful lot about Spey casting and steelhead fishing by spending a whole week with Ed. This was a unique experience. I will also miss talking with Oleg about fish biology. The Utkholok and Kvachina camps are situated roughly ten miles from each other. The helicopter was back in Petropavlovsk, and it would not be very smart to call it back just to transport three anglers on such a short distance. The WSC had found another solution: we would drive over the tundra with an all-terrain vehicle (AVT)! It is the only transportation that is able to move over the soft ground, and the old AVTs from the Cold War years are often utilised by the locals. We jumped on the impressive machine; Ken and myself were allowed to sit on top of the roof. What an experience! We ploughed through the tundra and over rivers, while spotting wildlife such as hares and ptarmigans. We also looked after bears, but they were not prone to show themselves. They are actually hunted heavily by the Russians, even if it is not legal! But they are here; we had seen fresh tracks along the riverbanks! After an hour and a half of driving, we reached the Kvachina Camp, where the American guide Michael, the Russian guide Vladimir, plus the rest of the Russian staff, welcomed us. Among the Russians was a biologist as well: Marina. Michael told us how the fishing was organised here: one team would stay and fish the Kvachina river, while the other team would ride on horses over to the Snatolvayam river! That sounded quite exciting to me! The first day, Jim and Ken decided to head for the Snatolvayam, while I stayed on the Kvachina together with Vladimir. In the morning I got a short pull in the fly, without hookup. In the afternoon, the fishing took off. After half an hour, I hooked a steelhead and fought if for about one minute before I lost it. Then, ten minutes later, a new hookup: I fought the fish for longer this time. I had to move upstream for 30 yards approximately, because where I was wading it was impossible to land a fish safely (steep banks). As I reached the landing spot, I made the mistake common to beginners with Spey rods: I tried to approach the fish while keeping the line tight, which resulted in a violent bend in the rod tip, and eventually the rod broke! Vladimir held the fish for a little while before it escaped. We didn’t get to make science on this fish unfortunately. Now I had broken my only Spey rod I had brought, and I wasn’t very happy to fish with single-handed rods for these big fish. Fortunately Michael lent me his own Spey rods for the last days of the expedition! In the evening, Jim and Ken came back on their horses, from Snatolvayam. They had both landed fish; Jim looked especially satisfied because it was his first of the trip. At night there was a very good atmosphere in camp, everybody was happy for the fishing day, and for Jim’s first Kamchatka steelhead! Next day it was my turn to try Snatolvayam, together with Jim and Michael. It had been snowing the whole night, so it was absolutely awesome to ride over the snow-covered tundra on horseback! It was the first time that I tried to ride a horse for real, and it was feeling very special to do it here in the middle of nowhere. It was impressive to see the others ride with their Spey rods; they looked like conquistadors with their long swords! I caught a steelhead rapidly that day on Snatolvayam; Jim got one at the end of the day. On the last cast I got another hookup, but lost the fish, because I fought it too hard. One learns for every fought and lost steelhead! These large and powerful fish leave you very little error margin. The last three days passed like the first ones. The water levels were stable, since the fallen snow did not melt, due to the low temperatures. This meant that we also often had to deal with ice in the rod guides. The water temperature dropped, and the fish got slower. The fights did not last as long as they would have under normal conditions. The last fishing day, I went to Snatolvayam again, together with Ken and Michael. The ride over was great as usual. Fishing was good, I got my fish, and Ken landed two in a ten-minute period! Incredible, the two fish looked like twins! In the evening, we rode home, tired and worn out. My horse was quite slow, and I ended up 500 yards behind the others. I tried to give my horse a little kick so it could go faster, and so it did! It started galloping at full speed across the tundra, catching up with the others. I was not very stable on top of it, but managed to stay on; I was convinced that it would slow down once it met its companions. But no, it just passed by very quickly and the others got excited, and they started galloping as well! As my horse made an abrupt turn, it fell off! Good that the tundra is so soft, it really made the fall less dangerous. I got a very sore elbow, fortunately it happened the last fishing day. The rod didn’t break, even if I landed quite hard on it. It would have been shameful to break two rods on the same week! The last evening in camp was celebrated as deserved, and the day thereafter we flew back to Petropavlovsk. I had been fed with Spey casting, steelhead, horse riding and beautiful nature in fourteen days! 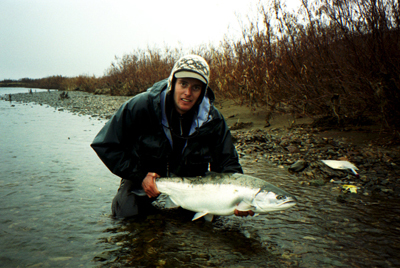 I had learned very much about steelhead fishing and its biology, and I had met many nice and interesting people. It was not a usual fishing trip I had participated in, I would call it a social cultural fishing trip! I have a very positive impression of the Russian people; these folks are just so warm and cordial.